Starting in the middle 1980’s, around the time that I wrote up A Short List of Musical-Cosmological Monochords, I began a patient compilation of diagrams. Most of them consisted of elaborate tables showing numerous just ratios calculated in cents, as well as some speculative monochords and representations of the Harmonic Series. I meant this work to accompany a text that sums up my investigations into Harmonics. Inevitably, it reflected my interests during the seventies and early eighties – just intonation, drone-based music, and monochords. I never got around to writing the text, though I left a couple of pages of notes. 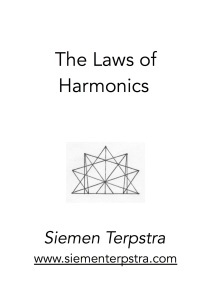 After a few years I scrapped the whole project and archived it under the rather imposing heading: The Laws of Harmonics. Recently I dragged it out of its storage to reconsider the project. This entry was posted in 12-et, 19-et, 31-et, 53-et, 612-et, History, Just Intonation, Meantone, Monochord, Multiple Divisions, Philosophy, Well-Temperament on 1 December 2014 by Siemen.